Body lotion with polidocanol and natural argan oil to soothe itchy skin. This gentle body lotion with polidocanol and natural argan oil is particularly recommended for those aged 50 and above, for irritated skin of any age including children, or for neurodermitic skin. 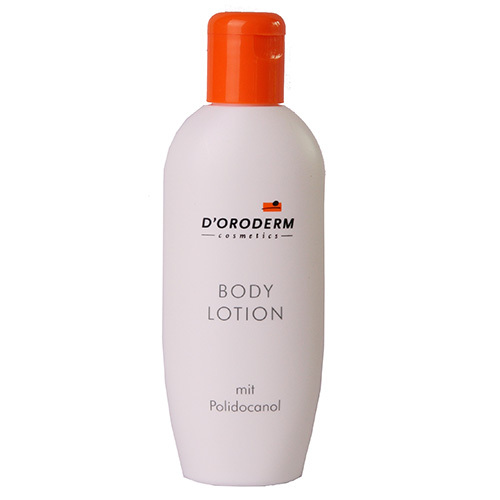 D´Oroderm BodyLotion has a rehydrating effect and regenerates tired and very dry skin. It soothes itchiness quickly and has a long-lasting effect; even very irritated skin feels pleasantly relaxed and cool. Use several times daily as required. Ingredients: Aqua (Water), Caprylic / Capric Triglycerides, Glycerin, Glyceryl Stearate SE, Dicaprylyl Ether, Laureth-9, Argania Spinosa Kernel Oil, Cetearyl Alcohol, Dicaprylyl Carbonate, Hexyldecanol, Hexyldecyl Laurate, Butyrospermum Parkii (Shea) Butter, Pentaerythrityl Tetraisostearate, Oenothera Biennis Oil, Lauryl Glucoside, Polyglyceryl-2 Dipolyhydroxystearate, Acrylates/Vinyl Isodecanoate Crosspolymer, Menthol, Ethylhexylglycerin, Parfum, Tocopherol, Citric Acid, Sodium Hydroxide, Phenoxyethanol, Benzyl Alcohol.